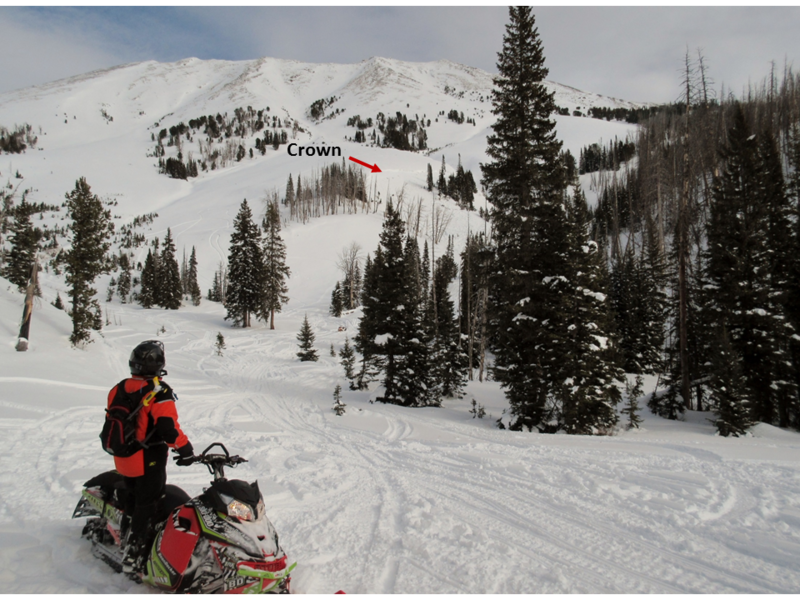 On Tuesday, January 2, a snowmobiler was caught and killed in an avalanche in Cabin Creek on the west side of Sage Peak in the southern Madison Range. Earlier in the day, a member of the group triggered a small, non-threatening slide. They all agreed to avoid larger, steeper slopes because of this sign of instability. Soon after, the group entered a gully at the base of a steep slope. 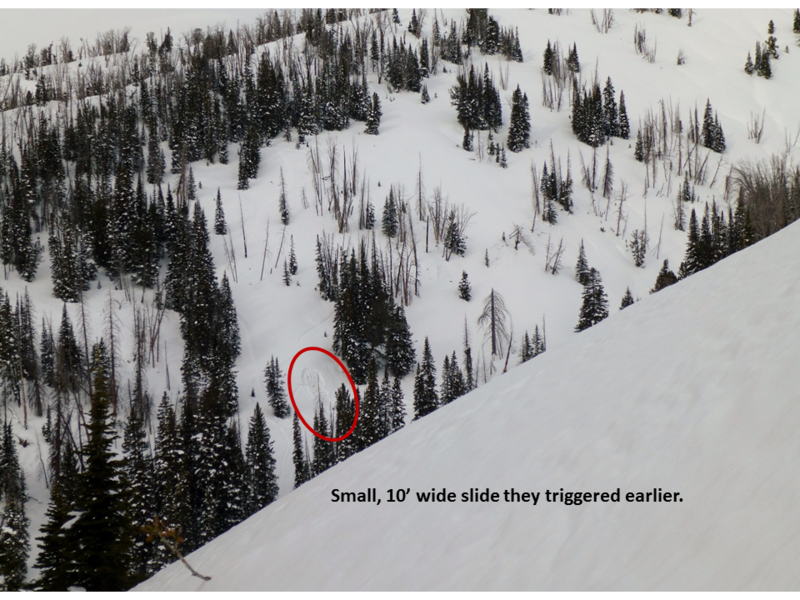 The victim was turning his sled around when he triggered the slide 300’ above him. 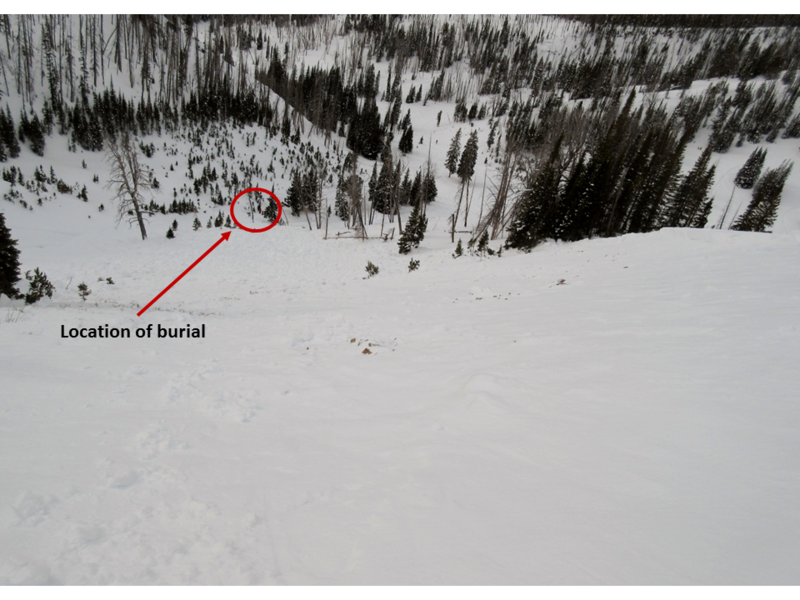 He was stopped when the avalanche hit, carried 25’ to the bottom of the gully and buried 3’ deep under his sled. His partners witnessed his burial, located him quickly and easily with beacons and dug him out in 12-15 minutes. CPR was performed but he did not survive. Every member of the party had proper rescue gear. The avalanche is classified as HS-AMu-R4-D2.5-O with a runout angle of 27°. This is the head of Cabin Creek with Sage Peak in the background. The crown is visible at the top of the slope. The slide ran 600 feet slope distance and was 36-40 degree steep. The group triggered this small slide (10' wide) on a nearby hill. Alex Marienthal stands near the 2-4 foot thick crown.